“Eat your breakfast Krshna” Ma said firmly as I sat at the table, dully making patterns with the cereal in my bowl. “I don’t want it” I said to her. “You don’t have a choice” she retorted, her fingers violently punching the keys on her laptop. “Feed me” I demanded. Ma looked up from her laptop. Needless to say, I went to school with a full stomach that morning. Working mothers. They always find a way. I’ve been in awe of Ma for as long as I can remember. I’d beam with pride when people asked me what my mother did. When I realised that she’d travelled to most countries across the globe. When I heard that her picture had found its way into the morning paper. As I was growing up, I’d watch her get ready for work and wonder how long it would take me to be like her. To have my office shoes click behind me as I walked. Rhythmic, urgent and decisive footsteps that echoed in the morning as she packed her things. To be the kind of person who typed on her laptop a lot, wore lipstick and heels every morning, and had the entire house stay quiet on the evenings she said she had a conference call to attend. 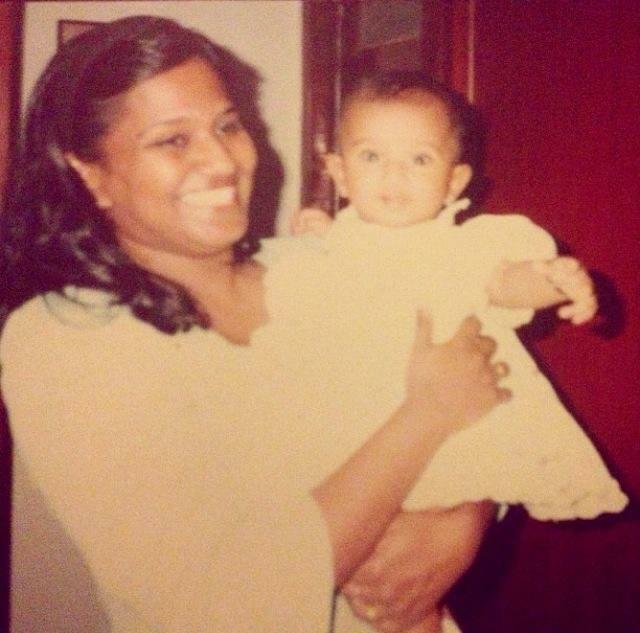 Over the years, Ma has been my role model in the truest, simplest sense of the word. I’d be lying if I said she made juggling home and work look effortless. She worked as long as my father, and often travelled a fair deal. When I think of Ma my memories don’t include being greeted with piping hot food after a long day at school, or hours spent going through that day’s lessons, or her feeding me little mouthfuls of my favourite dishes while I studied for my exams. But she always found ways to get things done. Besides threatening me with imprisonment for not eating, over the years, Ma had mastered a whole range of lifehacks. I remember how on the days she had to leave for work early, she’d give me a bath and dress me the night before, to spare herself the inevitable morning argument on what to wear to school. How she’d say “Write down the things you want for lunch this week” and stick the list on the fridge. How Parent-teacher meetings were often attended by a clueless father or grandmother. Or how she always kept an extra supply of everything from stationery to shoes, just in case she wouldn’t have the time to get them when I needed it. But looking back, I realise that I was never given a chance to believe that I missed out on quality time with her. Ma would take me on long walks during the weekends and ask me to tell her everything that happened that week. We’d talk about school, friends and the things I’d learnt. She’d write me speeches for my class assembly, and spend hours teaching me how to deliver them. We’d spend the start of every academic year wrapping my books in brown paper. My birthday parties were always elaborately planned, and the gifts she brought back for me from travel were always hand picked. And to this very day, irrespective of where she is, she has always answered a phone call from me. One evening when I was in the 4th grade, I mentioned to her that the book I was reading spoke of a midnight feast in the girl’s hostel. I still remember how a few days later, Ma woke me up at midnight and asked me to follow her to the kitchen. That night, we treated ourselves to a generous scoop of ice cream before going back to bed. It was no surprise that my grandmother would jokingly complain about how, despite all time she spent with me during the day, I was always the happiest to see Ma come home from work. Its made me realise that there is no such thing as the perfect parent. Just as there is no such thing as the perfect child. That the home-maker mom versus working mom debate is fundamentally flawed. That something as intangible as your relationship with your mother simply cannot be quantified, compared and analysed. That relationships this precious can only be measured by how they make you feel. I realise that the relationships we have with our mothers were never influenced by the number of breakfasts they made us, the bedtime stories they told or how many dance recitals they attended. But by how these gestures made us feel. I’ve always known that Ma constantly felt guilty about not being able to do these things. “Do you feel like I don’t spend enough time with you? Tell me the truth” she’d ask me often. But here’s the truth. From having to eat cornflakes for breakfast three days in a row, to the secret midnight feasts we had, she has always made me feel deeply loved. That when I look back at my childhood, I am lucky enough to undoubtedly say that I wouldn’t change a single thing. I don’t think there’s a better way to measure ones success as a parent. And for you, Ma, that’s all that should ever matter. This is so heartfelt; it had me in tears. So sweet and true. What a refreshing defense of the working mom! Tuts, you have made my day! Thanks sweetheart for this vote of confidence!! Trust you are doing fine! After Madhu’s return from Singapore we do not get much to hear about you,though I keep enquiring Madhu now and then as regards you. Admire your authentic portrayal of the beautiful parentage that you have enjoyed with your mom(am awaiting the one as regards your dad! )…..it is an honest description bereft of stereotypical assumptions and cliched expectations of ‘how mothers ought to be’.You have brought out the value and worthiness of the relationship quite objectively ,to say the least! Thank you, uncle. We really miss having Madhu around here. Such a ray of sunshine, she is. We must all plan a trip together when Madhu is back! And you did it again, Krshna. Beautifully written Krishna! You both are lucky to have each other! Not sure if my previous comment went through. Taken the liberty to share this on FB. Thank you….loved this post.